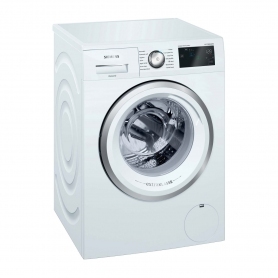 This attractive washing machine from Bosch is jam-packed full of fantastic features. With its A+++ -30% energy efficiency and EcoSilence motor, the WAT28370GB is sure to impress. Thanks to a whopping 9 kg capacity, the WAT28370GB is the ideal family washing machine – fit in bed sheets, linen and grubby school uniforms with ease. With so much choice, you’ll be fully prepared for any laundry task that comes your way. In addition, the handy Reload function allows you to add any missed items to the wash even once the programme has started. For added safety, the door will only open once the temperature is under 50oC and the water level is low enough. The large 9 kg capacity isn’t the only reason this model is the perfect family washing machine. The porthole is large, measuring 32 cm, and opens 165° so you easily get big and bulky items in. The EcoSilence Drive technology that powers the WAT28370GB makes it incredibly efficient and quiet, to make for a peaceful washing experience. This Bosch model also comes with anti-vibration technology, which cuts down noise and helps keep the appliance stable. The detergent drawer is self-cleaning too, saving you time and hassle. VarioPerfect Technology allows the WAT28370GB to finish cycles 65% faster or 50% more efficiently, allowing you to tailor your programmes to your laundry tasks. A handy child lock prevents little fingers from interfering with settings, and an acoustic alarm sounds when a cycle finishes. ECARF have awarded the Bosch WAT28370GB their seal of quality, showing the product is friendly to allergy sufferers. The WAT28370GB is amazingly efficient, thanks to all its energy-saving technology. As such, the appliance has been awarded an A+++ energy efficiency rating. A+++ is the highest rating currently available, but the WAT28370GB goes even further, being 30% more efficient than other A+++ models. This appliance will keep saving you money every time you run it. Armed with ActiveWater Plus technology, the WAT28370GB cuts down on wasted water too. A sensor measures how much water is needed, based on the quantity and type of material in the drum. Thanks to the optimised water distribution system and unique drum design, water penetrates the laundry quicker, reducing the amount required to fully soak items. The fully electronic dial lets you easily pick the programme and temperature you want with ease. Extra settings are chosen using the touch select buttons. Pick from a delayed start function, SpeedPerfect, EcoPerfect, Aqua Plus settings, spin speed reduction and others. The large LED display lets you see everything you have selected. 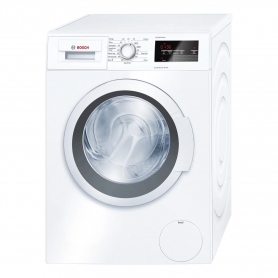 Take the hassle out of laundry day with the Bosch WAT28370GB washing machine. Order yours today.